Another long day on the road, covering over 600 miles with only about 40 of 'em being Interstate miles. I left the motel at 7:15 this morning -- literally seconds later, it began to rain, and the rain stayed with me from Houston through San Antonio. Through this area, US 90 mostly crisscrossed the Interstate, though sometimes the old roadbed was visible as a frontage road. San Antonio, of course, is best known for The Alamo, where fewer than 200 Texan soldiers held off 5,000 Mexican troops for 12 days before the Mexicans broke through the walls and slaughtered the defenders. Approaching the Alamo from the east, one encounters a majestic, pockmarked limestone structure oozing Texas history from every pore. Welcome to the gift shop. The Alamo itself is the unpretentious mission in back, facing the north side of Alamo Plaza; at least once every 30 seconds, a visitor exclaims, "Oh, it's so small!". Unfortunately, the Alamo is owned by the Daughters of the Republic of Texas, ancestor-worshiping descendants of the battle for Texan independence who never let facts or historical perspective intrude on the presentation. Inside the Alamo, a uniformed guard holds a sign advising, "THIS IS A SHRINE. QUIET, PLEASE." Although visitors may not photograph the Alamo's interior, the adjacent gift shop sells postcards and dozens of Texas and Alamo-related souvenirs. If the official selection is a bit too tasteful, try the Woolworth's across the street. 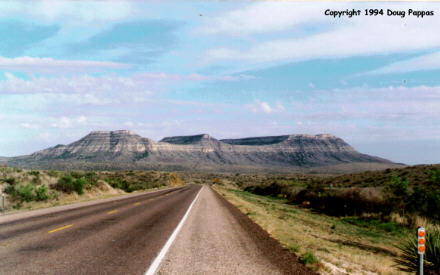 West of San Antonio, 90 settles into a pleasant two-lane road. The stretch between Del Rio and 90's end in Van Horn ranks among my favorite old-road drives of recent years: 300 miles of open roads, through widely spaced tiny towns in the desert. 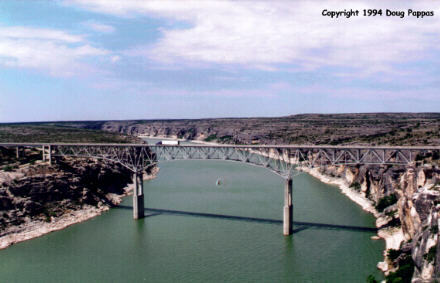 From the border town of Del Rio, US 90 passes through Amistad Dam territory; over the scenic Pecos River Bridge just a few hundred yards north of its junction with the Rio Grande; and to a rest area adjacent to Judge Roy Bean's old "Jersey Lilly" saloon. Armed with one law book and his trusty six-shooter, Bean reigned as "Law West of the Pecos" through the 1880s and 1890s. Bean held trials in his saloon, often fining defendants a round of drinks for the house. Once Bean acquitted a railroad worker charged with shooting a Chinese laborer, saying he found no law which forbade killing a Chinaman...then fined the corpse the $40 found in his pockets for carrying a concealed weapon! A short nature trail near the saloon leads past dozens of cacti and other desert plants. The next 200 miles continue across empty, empty land, running next to the railroad and occasionally showing signs of an earlier roadbed. If I'd had the time -- and a confirmed cabin reservation -- I could've swung an hour south through Big Bend National Park, but instead I raced the sunset towards Van Horn, barely losing the race. 90 ends here at the junction with former US 80, now Business Route 10. I stopped for the night in Van Horn, a few hours east of my next route, US 62.